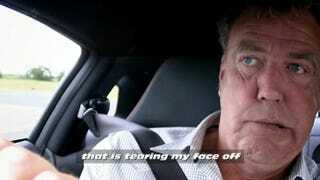 Is your torrent of Top Gear Season 17, Episode 4 not yet done? Then click through for our open thread on the episode that sees Jeremy review the Jaguar XKR-S under the — yet again — hammering beats of Daft Punk's Tron: Legacy soundtrack, James and Richard build a train with an Audi, and Rowan Atkinson shows why he could absolutely take over for Jeremy Clarkson. As of now, all we've got is Rowan Atkinson and the train segment of the show. But if they go down — because the YouTube Nazis will inevitably get to it — then do your part to put new clips and links in the comments below. Which is how we get the "Open Thread" we speak of in the headline up top.